Moto Camp Bulgaria, nestled in the tranquil village of Idilevo, sort of smack in the middle of Bulgaria. Sitting around the dinner table surrounded by like-minded people, mostly overland travellers, I paused for a moment of reflection. I felt such a surge of happiness. It had been a perfect day. Morning started with yoga instruction for some of the guests and part-owner, the vibrant and charismatic Polly . Then invited into the kitchen to learn how to make Polly’s special dish. Yes it has been a perfect day. 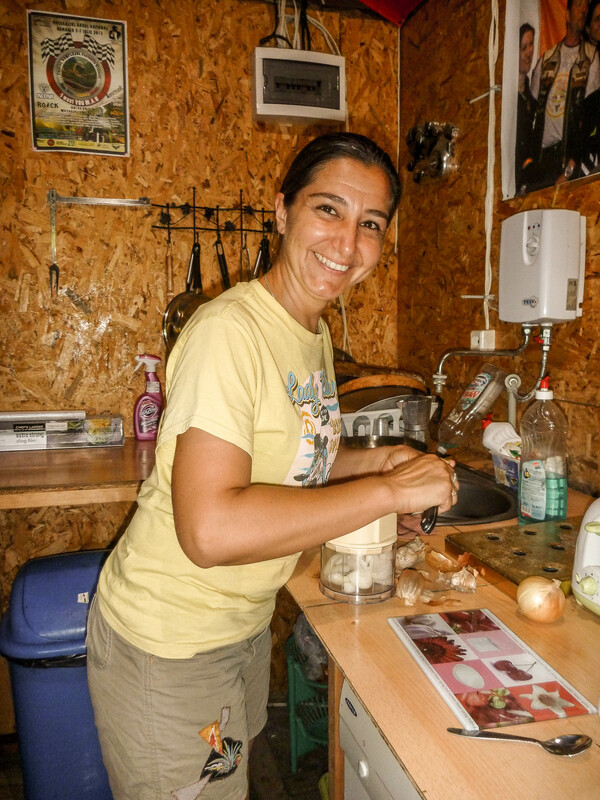 Polly thanks for sharing and also thanks to your lovely father for his homemade honey and yogurt. Moto Camp Bulgaria, you were so difficult to leave! 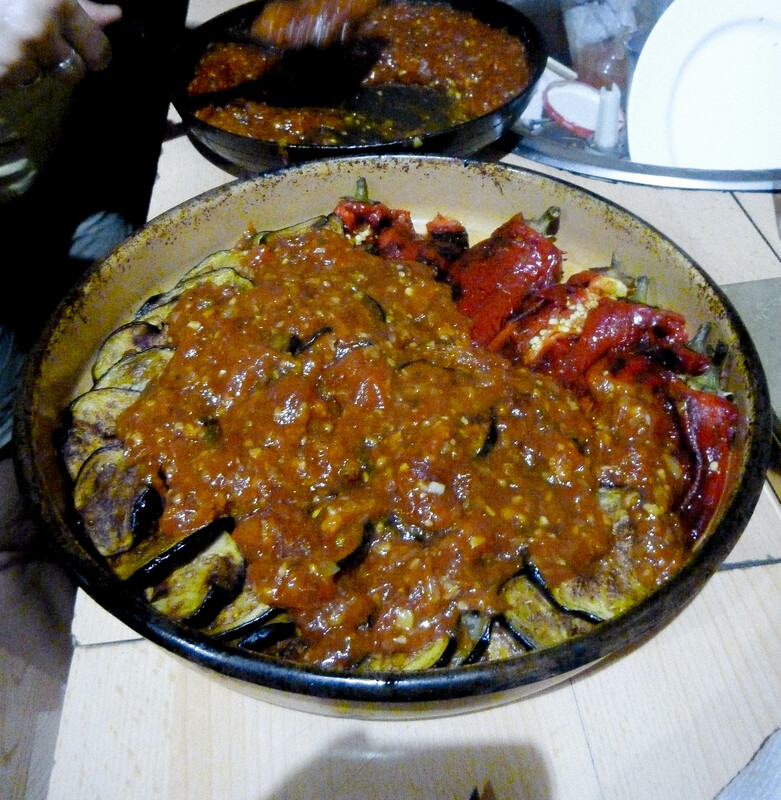 Polly’s special dish (family recipe, no official name) Aubergine and peppers smothered in a garlic-fuelled tomato sauce…….will definitely keep the vampires away! This dish is a great vegetarian dish on its own or used as a side dish to an accompaniment to a BBQ as served at the Moto Camp, by wonderful Polly. Slice the aubergines, sprinkle with salt and place in a colander to drain for 30 minutes. Roast red peppers in a pre-heated oven – remove skin. Chop and fry garlic in olive oil until soft (easier to use an electric chopper). Add oregano/basil/pepper/tomato purée/fresh tomatoes and cook for 10-15 minutes reducing to a thick consistency. Pat dry the aubergine with a tea towel or kitchen rolls, then fry the slices in olive oil and place on a large plate. Cover half the plate with peppers the other half with aubergine. Now pour over the delicious sauce and serve. Polly advised fresh herbs can be added and it is also scrummy with fresh mint.